A camera operator using the Steadicam in front of an audience. Steadicam is a brand of camera stabilizer mounts for motion picture cameras invented by Garrett Brown and introduced in 1975 by Cinema Products Corporation. It mechanically isolates the operator's movement, allowing for a smooth shot, even when the camera moves over an irregular surface. The camera could be mounted on a dolly, a wheeled mount that rolls on tracks or leveled boards. This procedure is time consuming to set up, and it is impractical in many situations. The camera operator could simply hold the camera. This manual grip allows speed and flexibility, but even the most skilled operator cannot entirely prevent shaking. Hand-held camera footage has traditionally been considered suitable mostly for documentaries, news, reportage, live action, unrehearsable footage, or the evocation of authentic immediacy or cinéma vérité during dramatic sequences. While these cinematic techniques are still common, the Steadicam has added another dimension to motion picture cinematography and videography. A Steadicam combines the stabilized steady footage of a conventional tripod mount with the fluid motion of a dolly shot and the flexibility of hand-held camera work. While smoothly following the operator's broad movements, the Steadicam's arm absorbs jerks, bumps, and shakes, while its almost frictionless gimbal gives precise control of the camera and framing. The Steadicam was introduced to the industry in 1975 by inventor and cameraman Garrett Brown, who originally named the invention the "Brown Stabilizer". After completing the first working prototype, Brown shot a ten-minute demo reel of the revolutionary moves this new device could produce. This reel was seen by numerous directors, including Stanley Kubrick and John G. Avildsen. The Steadicam was subsequently licensed to and manufactured by Cinema Products Corporation, which later diversified the brand into a consumer line for DV cameras. The Steadicam was first used in the Best Picture–nominated Woody Guthrie biopic Bound for Glory (1976), debuting with a shot that compounded the Steadicam's innovation: cinematographer Haskell Wexler had Brown start the shot on a fully elevated platform crane which jibbed down, and when it reached the ground, Brown stepped off and walked the camera through the set. This technically audacious and previously impossible shot created considerable interest in how it had been accomplished, and impressed the Academy enough for Wexler to win the Oscar for Best Cinematography that year. It was then used in extensive running and chase scenes on the streets of New York City in Marathon Man (1976), which was released two months before Bound for Glory. It landed a notable third credit in Avildsen's Best Picture–winning Rocky in 1976, where it was an integral part of the film's Philadelphia street jogging/training sequences and the run up the Art Museum's flight of stairs, as well as the fight scenes where it can even be plainly seen in operation at the ringside during some wide shots of the final fight. Rocky was also released before Bound for Glory. Garrett Brown was the Steadicam operator on all of these. The Shining (1980) pushed Brown's innovations even further, when director Stanley Kubrick requested that the camera shoot from barely above the floor. This prompted the innovation of "low mode" to mount the top of the camera to the bottom of an inverted post, which substantially increased the creative angles of the system which previously could not go much lower than the operator's waist height. This low-mode concept remains the most important extension to the system since its inception. A Steadicam rig was also employed during the filming of Return of the Jedi (1983), in conjunction with two gyroscopes for extra stabilization, to film the background plates for the speeder bike chase. Brown, who personally operated the shot, walked through a redwood forest, with the camera running at a speed of less than one frame per second. The end result, when projected at 24 frames per second, gave the impression of flying through the air at perilous speeds. In the Michael Crichton film Runaway (1984), a Steadicam rig was used to simulate the point of view of a futuristic smart bullet in flight while targeting specific individuals by their heat signature. The larger Steadicams are designed to support 35mm film cameras, digital cinema cameras, and IMAX cameras. 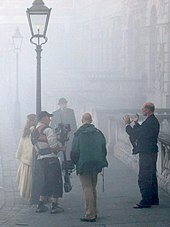 To film this recreated Victorian London street scene, the Steadicam operator is next to the lamp post, wearing a leather Steadicam vest. The operator wears a harness, the Steadicam vest, which is attached to an iso-elastic arm. This is connected by a multiaxis and ultra-low friction gimbal to the Steadicam "sled" which has the camera mounted at one end and counterbalancing weight (the monitor and batteries) at the other. The monitor substitutes for the camera's viewfinder, since the range of motion of the camera relative to the operator makes the camera's own viewfinder unusable. In the film industry the armature and weight are traditionally called the sled, as the two units combined resembled a sled in an early model of the Steadicam. The sled includes the top stage where the camera is attached, the post which in most models can be extended, with the monitor and batteries at the bottom to counterbalance the camera weight. This is how the Steadicam stays upright, by simply making the bottom slightly heavier than the top, pivoting at the gimbal. This leaves the center of gravity of the whole rig, however heavy it may be, exactly at the operator's fingertip, allowing deft and finite control of the whole system with the lightest of touches on the gimbal. The skill of the operator is to keep the desired framing and composition by feathering his touch on the gimbal, while the rig and operator is in motion, and, indeed, when still. The combined weight of the counterbalance and camera means that the armature bears a relatively high inertial mass which is not easily moved by small body movements from the operator (much as it is difficult to quickly shake a bowling ball). The freely pivoting armature adds additional stabilization to the photographed image, and makes the weight of the camera-sled assembly acceptable by allowing the body harness to support it. When the armature is correctly adjusted, operators can remove their hands from the Steadicam entirely and the camera stays in place. During operation, the operator usually rests a hand on the camera gimbal and applies force at that point to move the camera. To avoid shaking the camera when lens adjustments are made, a wireless remote operated by the camera assistant is used to control focus and iris. For low-angle shots, the Steadicam sled can be inverted vertically, putting the camera on the bottom, and the monitor and batteries on the top. This is referred to as low mode operation. The newest generation is the Tango. A body-supported camera-stabilization-system, its horizontal mechanism makes it possible to move the camera freely while staying horizontal. A Steadicam operator can change from low mode to high mode without any alteration. Dimensions are not limited to ups and downs, but also in depth and over or through obstacles. The smallest, lightest Steadicam that can be used with a support arm and vest is the Merlin. It is light enough to be hand held with cameras weighing up to about 5.5 pounds (2.5 kg), and may carry cameras up to about 7 pounds (3.2 kg) when used with the arm. The Merlin may be folded and carried in comparatively small spaces such as medium-size camera bags. In its lightest configuration, the Merlin weighs just 12.5 ounces (0.35 kg). Photographers who shoot with HDSLR cameras that combine still and motion photography most often work with the Merlin. Since the Merlin has no facility to carry a separate monitor, cameras suitable for it must have built-in monitors. Steadicam introduced a camera mount for smartphones, called the Smoothee, in 2012. Marketed to consumers instead of video professionals, its tubular frame supports iPhone and Android phones that are 4.53" to 6.26" long by 2.32" to 3.27" wide (115 to 159 mm long by 59 to 83 mm wide). An adapter can be used to fit a GoPro camera to it. An even smaller, camera-specific Steadicam Curve (a single, curved aluminum slash) is available for GoPro cameras. It is also marketed to consumers. 1978 – Academy Award of Merit – Awarded to Garrett Brown (The Cinema Products Corporation. Engineering Staff under the supervision of John Jurgens) for the invention and development of Steadicam. 2008 – Technical Achievement Award, awarded to Garrett Brown & shared with: Jerry Holway (inventor) (The Tiffen Company [us] (developer) ). For the Ultra2 Steadicam camera support system. 1992 – Technical achievement Award, awarded to Garrett Brown & shared with: Ed Di Giulio (CEO) Cinema Products) (developer) ). For the Steadicam camera stabilizing system. 2012 – The Steadicam Guild's Life Achievement Award, awarded to Garrett Brown (inventor and steadicam Operator) for his Invention of the Steadicam and his Steadicam work on nearly 100 major motion pictures. ^ a b "Steadicam Celebrates its 30th Anniversary at NAB 2005" (Press release). Tiffen. Archived from the original on December 25, 2005. Retrieved March 3, 2014. ^ Ferrara, Serena (2001). Steadicam: techniques and aesthetics. Oxford [u.a. ]: Focal. pp. 26–31. ISBN 978-0-240-51607-3. ^ "Manuals". Jerry Holway. Retrieved August 4, 2017. ^ "Steadicam Smoothee Universal Camera Mount". Tiffen. Retrieved July 7, 2017. ^ Kilday, Gregg (February 23, 2014). "Satellite Awards: '12 Years a Slave' Wins Best Motion Picture". The Hollywood Reporter. Retrieved December 3, 2014. Wikimedia Commons has media related to Steadicam. Look up Steadicam in Wiktionary, the free dictionary. "Steadicam Guild Life Achievement Award"
Fishko, Sara (December 15, 2016). "The Steadicam Story". Fischco Files. WNYC. Retrieved February 19, 2017. Produced for the thirtieth anniversary of the Steadicam. This page was last edited on 22 April 2019, at 19:03 (UTC).